This Can Change Your Financial Life! Several months ago, I asked 32,185 people to share their financial concerns with me. The response was incredible! So many of you took time out of your busy schedule to participate in a survey, and the responses were amazing. As we developed this resource, I realized I have never publicly shared the step-by-step process my family used to move from having an average bank balance of $4.13 to living a fully funded life. So for the FIRST TIME EVER in a public arena, I am going to be teaching that process, and YOU are invited to participate. 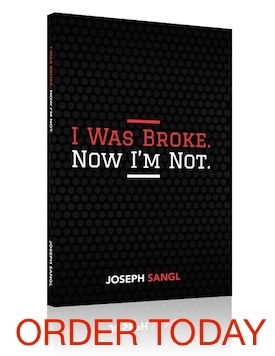 In this LIVE ON-LINE EVENT I will be teaching what I call the “I Was Broke. Now I’m Not. Ladder” – 9 Rungs To A Fully Funded Life. This information completely changed my life, and I believe it can do the same for you and your family! Using this proven process, my bride and I paid off all of our non-house debt in just 14 months. We paid off our HOUSE by the age of 38. It is pretty easy to live a fully funded life when your house payment is gone! Does this process work for others? Just ask Mark and his family. Mark and his family were earning income, but the money seemed to disappear as fast as it came in. Despite working a full-time job and several part-time jobs, the dreaded “knock on the door” happened one evening. At the door was a person delivering a home foreclosure notification. With over $85,000 in non-house debt and a foreclosure hanging over their heads, Mark and his wife attended one of my live events. I offered free one-on-one financial coaching, and they took me up on it. I walked them through the “rungs” of the “I Was Broke. Now I’m Not. Ladder” and suddenly everything clicked into place. For the first time in their life, they had a clear financial path to follow, a path they understood. It changed their life. It changed their marriage. They were able to save their home from foreclosure and eliminated all of the $85,000 debt. They are now living a fully funded life. I can’t wait for this great night of learning (and the major announcement)! I’m so passionate about providing this valuable knowledge that I am having our team take steps to accommodate tens of thousands of people. You read that right – tens of thousands of people! I want you to be free to invite the special people in your life to participate because I truly believe you know people who are dissatisfied with their current financial situation and need help! Let’s transform the way this continent manages money! I’d like to see this but I’m working. Also missed the local even here in VA in June for work. If I register but cannot watch live, will I have access to view it afterwards? I am interested in registering but I live in Canada and it won’t let me.